Palestinian media are reporting that the Jenin branch of Fatah, which is headed by Palestinian Authority (PA) President Mahmoud 'Abbas, had given an apartment to the family of Ahmad Nassar Jarrar, 22, commander of the Hamas squad that murdered Rabbi Raziel Shevach on January 9, 2018 near the Havat Gilad junction in the West Bank. Jarrar was killed by Israeli troops a month later, in a February 6, 2018 raid. Fatah representatives noted that the donation of the apartment constituted fulfilment of the national obligation to the family of a martyr who had sacrificed his life for Palestine and whose home the occupation had razed. Jarrar's mother and brother thanked Fatah for its support. The following are translated excerpts from reports on the matter in the Palestinian media, and expressions of esteem for the martyrs by Palestinian Authority (PA) officials. "Fatah Jenin secretary Nour Al-Din Abu Al-Rab told Wafa that the donation of the apartment to the Jarrar family was aimed at underlining that the Fatah movement was fulfilling the national duty towards the families of the martyrs whose homes were razed by the Israeli occupation. He noted that the apartment was fully furnished and praised the part played by all those who had contributed to this national task that, he said, proved that our people is united and consolidated and does not forget its martyrs who gave their lives for Palestine. "The martyr's mother, on her part, praised Fatah for providing her family with an apartment after the occupation destroyed their home." On its official Facebook page, Fatah posted a video showing Jarrar's mother thanking Fatah for its support of the family. Source: Facebook.com/officialfateh1965, February 24, 2018. Also in a post on the Fatah Facebook page, Ahmad's brother Sohaib Jarrar thanked Fatah Jenin officials and all those who had helped by supporting the family. 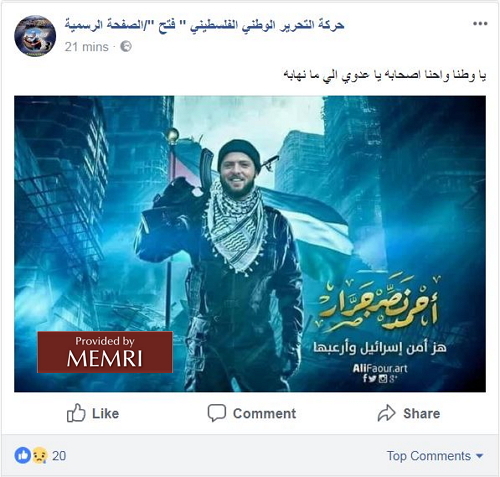 It should be mentioned that, following the murder perpetrated by Jarrar, and after he was killed by Israeli troops, the PA and PA-affiliated media, as well as Fatah's official Facebook page, lavished praise on him, describing him as a hero and martyr, a symbol of the armed struggle against Israel and a role model for Palestinian youths. PA and Fatah officials accused Israel of escalating the violence and promised to continue the resistance and follow the example of the martyrs. Palestinian Authority Officials: The Aid To The Families Of The Martyrs Constitutes "Appreciation For Their Sacrifice"
It should be noted that PA officials have recently made other statements highlighting the aid and support for the families of terrorists. For example, Tulkarm governor 'Issam Abu Bakr accompanied representatives of the Palestinian security apparatuses on a visit to the Tulkarm branch of the National Gathering of Palestinian Martyrs' Families, and spoke there about "the tremendous sacrifice by our martyrs for freedom and independence on the way to establishing an independent state with Jerusalem as its capital." He also noted the importance of aiding the families of the martyrs and standing alongside them "as appreciation for their sacrifice." Statements of support for the families of the martyrs were also made by PA officials in response to Israel's intention to withhold some of the tax revenues it collects on behalf of the PA and later transfers to the PA. Following the February 18 approval by Israel's Ministerial Committee for Legislation of a bill under which funds paid by the Palestinian Authority to Palestinian prisoners and the families of martyrs would be deducted by Israel from these tax revenues, the Palestinian Information Office called the bill "terrorism," and added: "The Palestinian people will not abandon its martyrs and prisoners, who sacrificed their lives and their youth in resistance to the occupation." PA Prisoners Authority chairman 'Issa Qaraqe' said, in a similar vein: "We oppose depicting the imprisoned fighters and the martyrs as terrorists and criminals," and called the bill "a campaign of incitement and hostility against the prisoners and the families of the martyrs." See MEMRI Special Dispatch No.7329, Palestinian Authority, Fatah, Jordanian Press Extol Perpetrators Of Recent Terror Attacks In Israel, February 12, 2018. On these payments, see MEMRI Daily Brief No. 97, MEMRI President Yigal Carmon's Testimony To House Committee On Foreign Affairs, July 6, 2016: Palestinian Authority Support For Imprisoned, Released, And Wounded Terrorists And Families Of 'Martyrs' , July 6, 2016, and other MEMRI reports.